Graduating college is certainly something to celebrate, but it is also expensive! 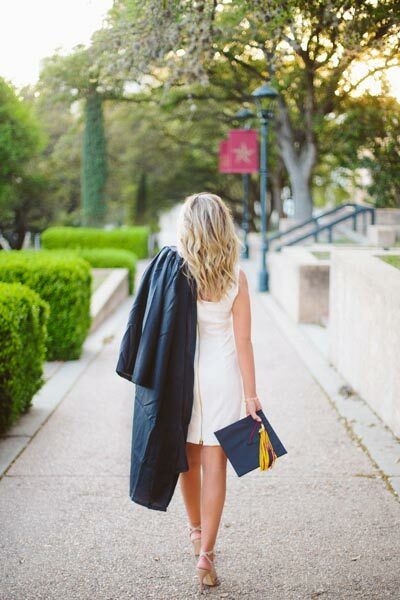 Not only do you have to cover the cost of your robe and cap along with a new outfit and other associated costs, but you will also find yourself paying for professional college graduation pictures. Some colleges will provide a photographer on the day that you can book time with, but often the resulting images are somewhat boring. Everyone gets the same pose and the same setting. These pictures are going to commemorate your college experience, so wouldn’t you rather have college graduation pictures that reflect your personality? That’s why we’ve gone in search of some unhackneyed ideas for more interesting grad photos! We love the idea of bucking convention completely and losing the traditional cap and robes. This college graduate decided to ditch the robes and have her college graduation pictures done in a pretty dress instead. 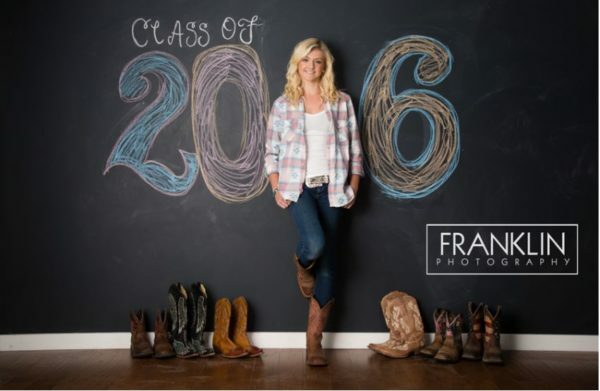 However, she did include a clever nod to the occasion by writing “Class of 2014” on the soles of her stylish cowgirl books! 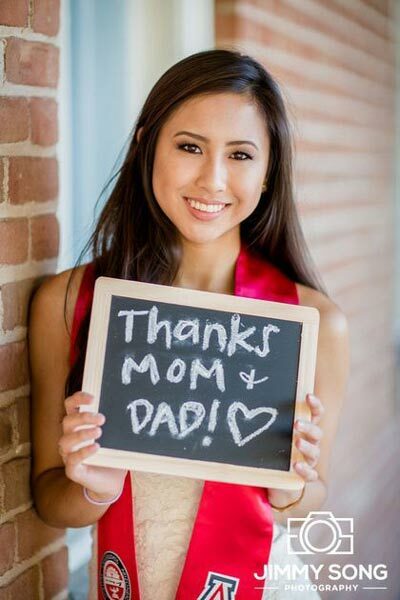 Using chalkboard signs is an increasingly popular prop in all sorts of photography, but we particularly like the way it has been put to use in these college graduation pictures. Most students rely heavily on their parents to get through college either financially or just for emotional support. Why not take this opportunity to thanks mom & dad for putting you through your higher education? Who says college graduation pictures must be a traditional portrait? One of our favourite grad pictures is this striking image which doesn’t even show the student’s face. She has her robes slung over her shoulder and is walking off to begin her new life as a graduate. It’s cool and stylish and sends the message that there is no looking back – focus on the future! For some college graduates, the focus has not necessarily been on academics. Some students excel in other aspects of college life such as sports. If this is the case, then maybe that is what you want to highlight in your college graduation pictures. 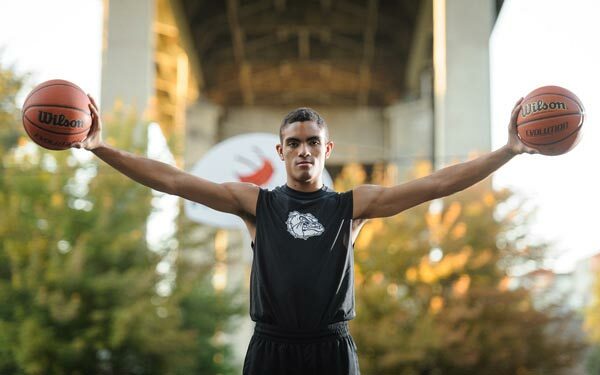 This graduate used his photos to demonstrate his college basketball career. Sometimes, the best photographs are the ones that are not posed. We adore this candid shot where the student has glanced back towards the audience, perhaps seeking out her parents in the crowd. 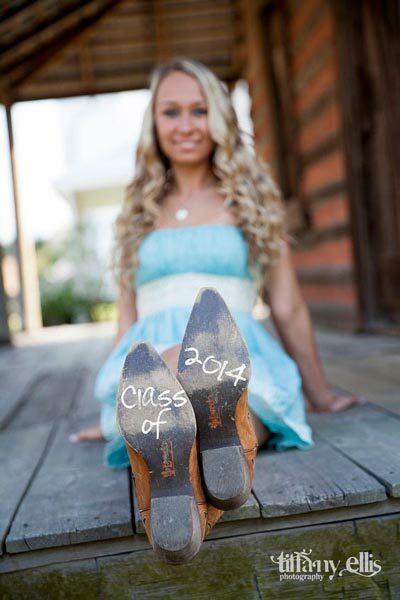 Have your photographer take some candid shots instead of formal portraits for a cool twist on your grad photos! 6 – Chalk It Up! If you like a simple yet striking portrait with a little creativity then you might want to try this cute chalkboard idea! Decorate a chalkboard with the graduation year and have the student stand in to represent the number one! It’s been a long road getting to graduation, so why not show that in your college graduation pictures? 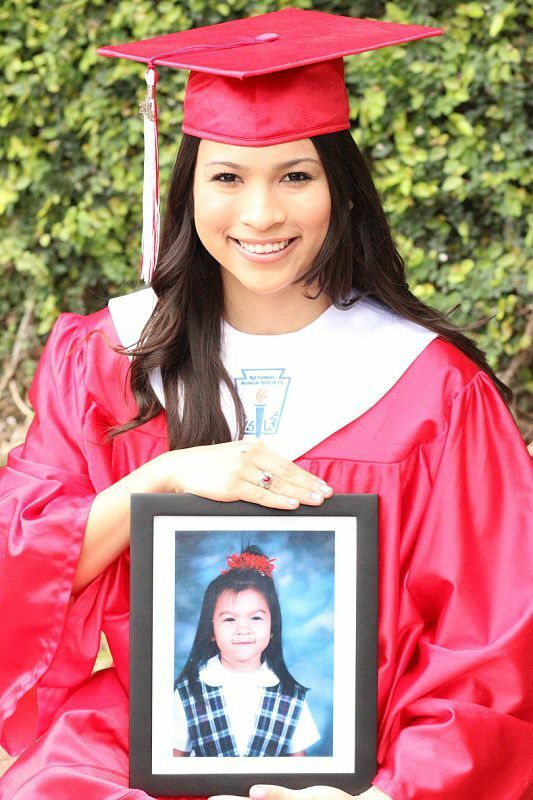 Grab your first day of school portrait – you know mom still has it – and hold it in your graduation portrait to show just how far you have come since that first day of your academic career! One of the iconic moments in any graduation ceremony has to be the tassel, so make it the focal point of your college graduation pictures. 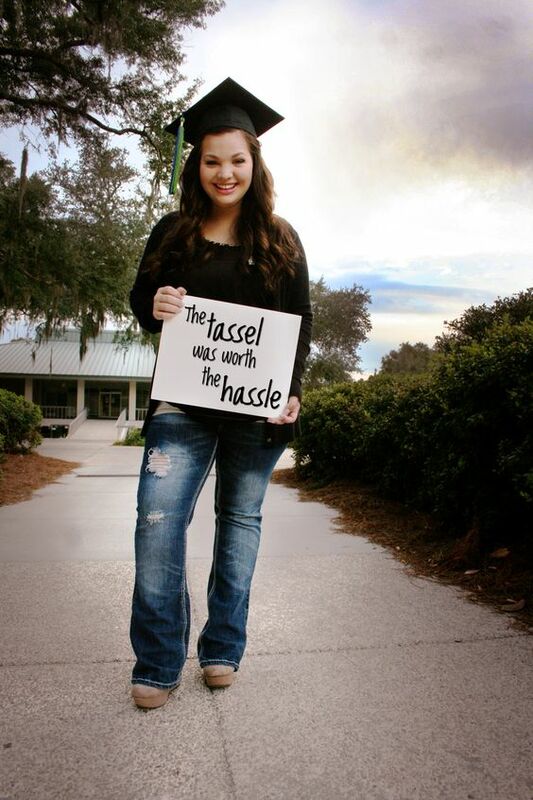 We’ve seen a lot of grad photos where the photo is zoomed in on the tassel, but it’s been done time and time again, so this one puts a fun twist on it with the student holding a sign proclaiming that ‘the tassel was worth the hassle’! It’s a really cute idea! You may be saying goodbye to college, but it will always hold a special place in your heart. We love the idea of capturing school spirit in your college graduation pictures by incorporating the mascot into your portraits. 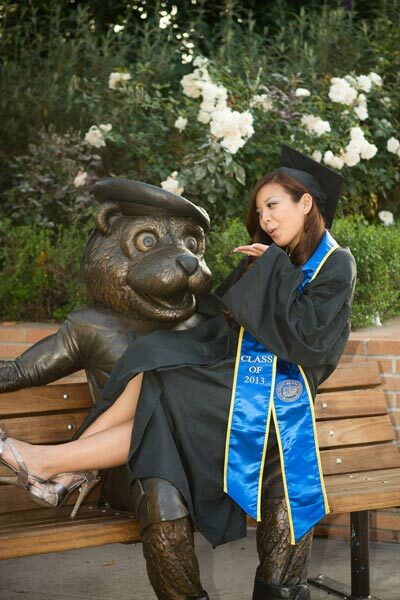 We love this fun shot of a new grad sitting in the lap of the school mascot’s statue. It’s fun and unusual but with a nod to school traditions. These are just a handful of ideas that can help you take your college grad photos to another level. Don’t settle for a boring portrait like everyone else. Make it fun and full of personality! This is a big day in your life and you want to remember it, so step out of the ordinary and create something special to commemorate the occasion. And don’t forget to have fun after the official part of the graduation day. Check out graduation party ideas to make this day legendary!